Grand Street Restaurant Week: Gentrifier’s Grub, or Feeding Local Biz? Yesterday a dozen restaurants along Grand Street in East Williamsburg kicked off their second-annual Grand Street Restaurant Week, the area’s very own location-specific version of the mammoth that is New York Restaurant Week, complete with prix-fixe lunch and dinner specials. Depending on your view, you might interpret the event as either an odd/scary fit for the neighborhood or a harbinger of good things to come. It bears reminding that, usually in order to participate in Restaurant Week, you first need to feel financially able (or reckless enough) to drop $30 to $40 on a single meal. 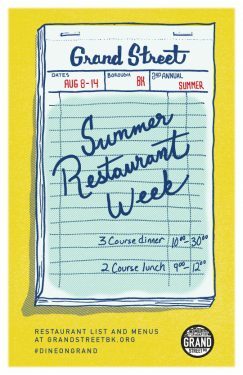 Regular NY Restaurant Week, also happening right now through August 19, offers $29 lunches and $42 dinners, and understands multiple courses as inherent to both meals. So it seems that, more than likely, people patronizing Grand Street Restaurant Week would fall squarely into the “gentrifier” category, the type of folk who want to prance around in luxury-dorm/playground buildings that are masquerading as apartments or pre-fab “artist communities” but are actually closer to cruise ships (the first-class decks, obviously). Actually, you’d be sorely mistaken for assuming that Grand Street’s restaurant week caters solely to these kinds of people. Turns out, East Williamsburg’s #DineOnGrand event boasts not just tasty food, but prices that are palatable for the wallet too, with some lunch specials running as low as $10 and dinners $18. That’s pretty comparable to what you’d spend on any old eat-out meal, sometimes even cheaper when you consider what you’re getting. Maybe they’re onto something here. And what sort of restaurants are offering specials? Are they just the shiny new spots meant to attract people of a paler pallor to the area? The folks behind the venture, the Grand Street Business Improvement District, have been around since 1980 and seem fairly aware of the multifaceted community they are meant to serve, stating in their mission that they cater towards “a very diverse and vibrant community that is still African American, Dominican, Italian, and Puerto Rican with an influx of younger urban professional as well as an artist community.” In the past, they’ve facilitated events like an electronics recycling program, a holiday window display contest for local businesses, and a weekend block party– all very inclusive neighborhoody happenings. 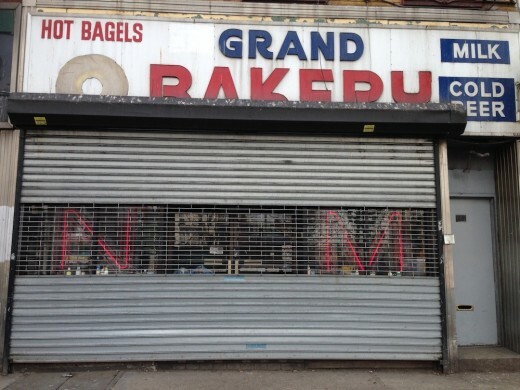 In 2014, B+B reported that more than a dozen storefronts on Grand Street, spaces that are largely used to house smaller mom-n-pop shops, lay empty. At the time, a developer stated that he was waiting for “a migration to the Eastern part of Williamsburg”– because, you know, it’s not like there were people there before or anything. It’s unclear how much business has actually boomed since then: in April 2015, the Brooklyn Reporter announced that the Grand Street BID was hosting a “tour and breakfast information session” for prospective buyers, alongside NYC Business Solution Centers and CPEX Real Estate. The tour showed as many as ten available properties for rent. Perhaps this Restaurant Week, which showcases 12 restaurants on the very same stretch that seemed to be recently yearning for tenants a couple years back, is indicative of a resurgence in business. However, it’s also the second Restaurant Week of the year, so this could just be a continued plea for more business in an area that exists on the strange outskirts of two very trendy neighborhoods. The cuisine, however, reflects Brooklyn’s diversity: Russian, French, Japanese, Mexican, Indian, Dominican, even stuff as simple as sandwiches. Thanks be to two pieces of bread and whatever they have smushed between, so even if you have the tastebuds of a five year old, you can still impress your friends by saying you went to Restaurant Week but really you just got a sandwich. One of the oldest and locally-owned joints on the list is 24-hour Mexican diner Grand Morelos, which offers a wide variety of Mexican dishes (burritos start at $5.50, please take note) alongside more traditional diner fare ($9 for French toast, eggs, and bacon), as well as a large selection of cakes and pastries on display in gleaming glass cases, with more authentic Tres Leches cakes and flans resting next to cookies and doughnuts. According to a 2013 profile in the Village Voice, Grand Morelos is “true neighborhood institution” that’s been around since the late ’90s. Their specials for Restaurant Week are a two-course lunch consisting of soup or salad paired with a torta (that’s a sandwich for all you plebes out there), burger, or burrito with fries ($8.95), or an $18.95 three-course dinner with richer appetizers, Mexican main courses like mole poblano and enchiladas, plus a choice of dessert. Similarly, there’s Haab, a homestyle Mexican eatery; co-owner and chef Jorge Espinosa became interested in cooking while growing up near the food stands of seaside Mexican town Puerto Morelos. Haab, named for the Mayan calendric system, originally set up shop in Woodside, Queens in 2004, and expanded to East Williamsburg before also making a home in Park Slope. Their lunch special this week is a tidy $10 and features mostly egg-based items like a breakfast burrito paired with a starter like elote or tostaditas, and their three-course dinner ($18.95) includes a margarita, beer, or dessert. We repeat: booze! Some other participating restaurants are relatively new, like Russian spot Masha and The Bear which has borscht vodka on tap (?!) and opened in January 2015. And for all you Marxist hardliners out there, Masha is certifiably legit Russian food. Then there’s Indian Kitchen, which opened a little over a year ago. 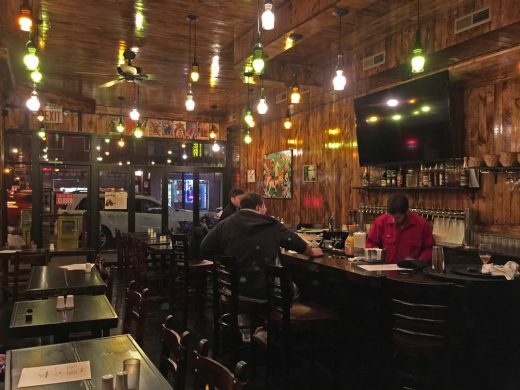 This family-owned spot is a bit more low-key than the rest of the Grand Street crew, eschewing novelty alcohols for more standard fare and offering the cheapest dinner special: $10 for one person, $18 for two people. And if you’re feeling fancier, you can live that good life as well: at Desy’s Clam Bar, originally stationed at Kenmare Street in Little Italy for 20 years until it was “displaced” to Grand Street’s “grungy block” (so said Time Out in 2010, when the restaurant moved to the area), where for $30 you can enjoy a three-course Italian seafood n’ mozz feast. There’s also French resto called Le Barricou, where you can get escargot with your moules frites or coq au vin– or like, a salad plus mac-and-cheese “au gratin,” if you’re a wimp– and a key-lime tart for $30. Le Barricou’s been around since 2006 and is celebrated for their decadent brunches. And that’s just a sampling of the places to go. So, looks like it’s possible after all to participate in Restaurant Week without draining your wallet while also supporting smaller, family-owned businesses who actually hail from the countries whose cuisine they’re slingin’ and have a legit stake in the nabe. Not bad, Grand Street, not bad. The Grand Street Business Improvement District’s Grand Street Restaurant Week continues through August 14 in East Williamsburg. More info here. Instagram your food with the hashtag #DineOnGrand and you just might win a $25 gift card to a participating Grand Street restaurant.